We’d love your help. 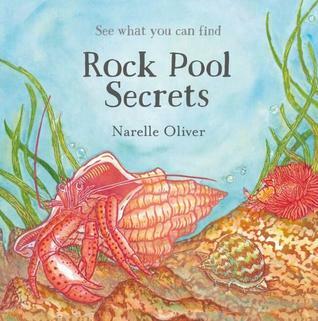 Let us know what’s wrong with this preview of Rock Pool Secrets by Narelle Oliver. To ask other readers questions about Rock Pool Secrets, please sign up. It is with great pleasure but also great sadness that we read Narelle Oliver’s Rock Pool Secrets. This richly illustrated picture book is testament to Narelle’s wonderful skill as an artist and also her care and concern for the environment, sustainability and the creatures of the ocean. Readers will be engrossed in this exploration of rock pools and all the secrets held within and beneath them. Sturdy flaps, when lifted, reveal a complexity of many and varied sea creatures; some of which are obv It is with great pleasure but also great sadness that we read Narelle Oliver’s Rock Pool Secrets. This richly illustrated picture book is testament to Narelle’s wonderful skill as an artist and also her care and concern for the environment, sustainability and the creatures of the ocean. Readers will be engrossed in this exploration of rock pools and all the secrets held within and beneath them. Sturdy flaps, when lifted, reveal a complexity of many and varied sea creatures; some of which are obvious and some camouflaged in the crevices of rocks and shells. Children who are interested in the natural world and their local environment will be fascinated with the depictions of sea cucumbers, crabs and sea anemones. The text, describing each creature's unique attributes, has a perfect rhythm to match Narelle’s signature lino cut illustrations. The addition of a pictorial glossary is also very useful for those students who want to learn more about sea creatures and their environment. This is a wonderful addition to your library and especially useful for preps to year 3. 'Then the tide goes out and the sea is calm. Each spread of this picture book features a different creature in the rock pool and most spreads contain a large, shaped flap that reveals more details about the creature. Thus, the spread about sea anemones shows them with their tentacles extended and when you lift the flap, you see the same scene but now the anemone's tentacles are retracted. As well as anemones, this book also shows hermit crabs, decorator cra 'Then the tide goes out and the sea is calm. Each spread of this picture book features a different creature in the rock pool and most spreads contain a large, shaped flap that reveals more details about the creature. Thus, the spread about sea anemones shows them with their tentacles extended and when you lift the flap, you see the same scene but now the anemone's tentacles are retracted. As well as anemones, this book also shows hermit crabs, decorator crabs, shrimp, goby fish, starfish, octopus, sea slugs and turban shells. After introducing all the creatures, there is a spread of the entire rock pool with an invitation to find all the animals described. This book features beautiful lino print pictures with minimal text making this book ideal for young children who will enjoy opening the flaps and trying to find the hidden creatures. For those who would like more information, there is a glossary at the back that gives further information about the animals depicted. 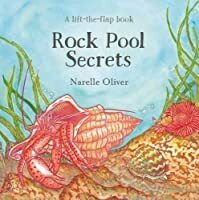 Rock Pools are always a fascinating place to be and there is so much hidden deep down crevi Rock Pool Secrets by Narelle Oliver was the last book she produced in her artistic career and it truly is a wonderful book to be remembered by. This book shows you what you can find in rock pools during low tide at beaches. As you read this picture book there are flip sections on a few of the pictures where you can get a better look at the creatures that live in the rock pools. The pictures are beautifully done. Narelle Oliver (1960 - 2016) was an Australian artist, print maker and award-winning children's author-illustrator. Narelle Oliver was born on 25 February 1960 and grew up in Toowoomba in south east Queensland. Oliver majored in design and printmaking while studying for a Bachelor of Education degree. She began her career teaching at the Queensland School for the Deaf. Oliver was an educator and a co Narelle Oliver (1960 - 2016) was an Australian artist, print maker and award-winning children's author-illustrator. Oliver was an educator and a committed environmentalist. As an illustrator, Oliver combined linocut, watercolour, pastels, collage and digitally-enhanced photographs in her work. She used many environmental themes drawing on the flora and fauna of Australia.